You’ve almost certainly heard of Jon Morrow. He is an expert when it comes to getting more traffic flowing through your blog, and making sure your readers are fully engaged. He’s written and edited for the likes of Copyblogger and Kissmetrics, before finally creating his own business at Boost Blog Traffic. You may have already noticed, but Jon has recently undertaken the difficult task of evolving and rebranding it as Smart Blogger. Now it better identifies the multitude of different things he does to help bloggers with every aspect of blogging. Jon is one of the most successful copywriters around thanks to his unique attention to detail. But it probably also has something to do with him writing stories since the age of four. And in fact, his mother still has those early notebooks. He’s since come a long way since writing about dogs, cats, and monsters. So find out what led to Jon’s stunning success as a blogger, and what tips he has so you can achieve similar greatness. Jon has a type of muscular dystrophy called Spinal Muscular Atrophy, which results in his muscles becoming weaker as they get older. It’s the No.1 genetic killer of infants in the world, and at the ripe old age of just 34, Jon is one of the oldest people with the disease. However, it has left him with the ability to now only move his face. 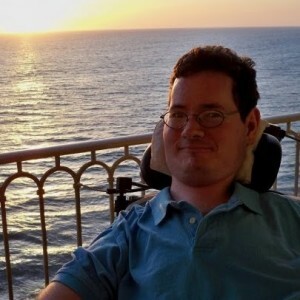 That means everything he does online is achieved using speech recognition software, and a lip-operated computer mouse. Going back 15 years when he was just starting to lose his ability to type, the software was relatively Neanderthal compared to what exists today. In fact, back then he had to spend over 100 hours training his speech recognition software to make it fit for purpose. 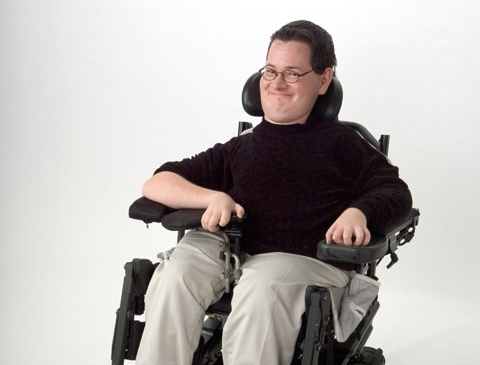 However, he sees his disability as a blessing and a curse. Of course, it makes life difficult and has given him many challenges. But he admits that it does give him a good story to tell, which makes him more memorable. And because the disease means there are many things he can’t do, he finds it much easier to focus than the rest of us. 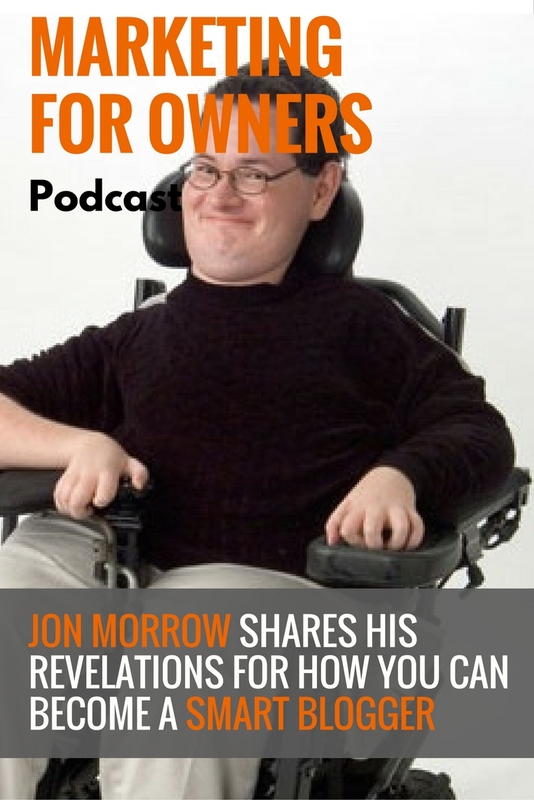 After he graduated from college, Jon went into his father’s real estate business as an executive. Although the money was good, he found it boring. So he spent his evenings writing blog posts. He did this for years, but with no idea of what he was actually doing, and it went nowhere. However, after the big real estate market crash around 2008, he found himself needing to find a new career. And he decided to dedicate himself to blogging. But when it wasn’t quite working out, he hired Chris Garrett as his mentor. He paid him in a last ditch effort to talk himself out of quitting his blog. With the things Chris taught him and the changes they made, he found his personal finance blog was getting over 1,000 views a day, just two months later. He’d also been a student of Brian Clark’s Copyblogger program Teaching Sells. And with him and Brian getting to know each other, Jon started writing posts for the website, which ended up being incredibly popular. In the end, he was an editor for Copyblogger at around the same time he’d been offered $10,000 for his blog. When he joined the team, he was told that headlines are the most important part of a blog. After all, that’s the first thing people see and it needs to grab their attention. So Brian told him to write 100 headlines a day in order to practice. A month later, he went back with 3,000 headlines. And in fact, Jon found the exercise so useful, he carried on doing it every day for a year, after which he ended up with around 36,000 headlines. Jon ended up staying at Copyblogger for four years before Neil Patel hired him as Editor in Chief on his new Kissmetrics blog. Although Jon only stayed there for a few months, it was long enough to teach the new teach him secrets to brilliant blogging. He soon decided he wanted to make money for himself, rather than others, so started up his own venture with a course about guest posting. With a reputation as being able to boost blog traffic, his name was born. And in just 60 days of starting to build a pre-launch subscribers list, he’d managed to achieve 13,000 interested people. At the time, it was the biggest blog launch ever, and within six months he was making half a million dollars in revenue through his courses, membership, and coaching. In fact, his reputation had allowed him to charge $10,000 for his coaching services and was a huge success. Since then, Boost Blog Traffic has branched out and become a lot more than just about boosting traffic. It covers everything which affects bloggers. His business had evolved, and his name needed to as well to reflect that. He wanted a name that was not only more representative but also one which would get him the respect of other influencers. When the name changed over to Smart Blogger, he and his team did find that traffic dipped. But within a few months, his blog was enjoying more visitors than prior to the change. 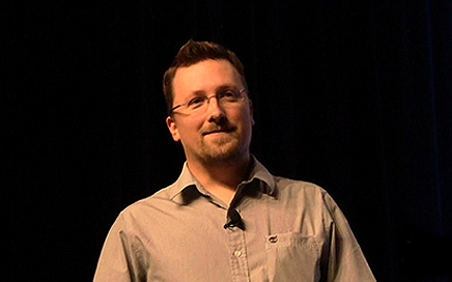 And he credits its evolutionary success to Dan Shure from Evolving SEO. It took Jon a lot of work to make his blog launch one of the biggest. There were three major tactics he employed to manage it. Firstly, he wrote guest posts for all the big blogging websites. He was a good writer who had clout, so luckily he didn’t find it too difficult to get the gigs. And he estimates that helped him to get nearly 3,000 subscribers. He also created his free download Headline Hacks. By spreading the word about it and only asking for an email address in return, this managed to bag him around 7,000 subscribers. And on top of that, he also provided the option for people to easily share the free download with their friends and colleagues, which he credits for thousands of extra downloads (and subscribers). Finally, he also ran webinars for companies such as AWeber and Copyblogger. Generally, about writing good headlines, he did these webinars for free. All he asked for was the email addresses of everyone who registered for it. Generally, it’s easy to get a blog these days. But it isn’t easy to get people to it to read your posts. And not only that, you’re also fighting against everyone else who is also trying to get attention. To win, you really have to be the best. In fact, to get more traffic you’ll need to be in the top 1%. However, that’s only important if you’re using the blog to try and get new customers. It is far easier to use a blog as a way of communicating with your current and potential customers. Traffic is no longer the goal. Instead, it’s a tool for following up and building trust. A mistake which people make is that they see blogging as a way of getting free traffic. But the reality is that it requires skill and time. And as a business owner, time is money, which means it technically isn’t free. There is a gap between expectation and reality. So now that we’ve established that your time is highly valuable, you need to discover the best way of spending it. And that’s where tracking comes in handy. When he was starting out with his blog, Jon found that he received the best value for creating the webinars. On average, for every hour he spent on them, he received 1,000 new subscribers in return. Guest posts were also an efficient use of his time. For each one he wrote, he was receiving an average of 1,000 subscribers too. Which put into perspective, for other guest post writers, 20 new subscribers was a good day at the office. He managed to achieve those numbers with his guest blogging because he had the skill to write posts which got traffic thanks to his ability to embed links and write good by-lines. In fact, some of his top guest posts were receiving 20,000 subscribers, which is otherwise unheard of. But with these top guest posts, he really put in the effort. The one’s which received over 1million views were the posts he’s spent over 100 hours producing. In Jon’s mind, if you’re going to write for a potentially huge audience, it’s a great opportunity and one which needs the most making of it. He spent weeks refining drafts until he had literally thought about every single word. Plus he knew exactly what he wanted to achieve with them. He knew how he’d want them to feel after reading it, and who he wanted them to then share it with. And just like an Olympic athlete, it takes a lot of hard work and training. Every day, even at Christmas, he was writing over 2,000 words a day. Even when he was in a hospital bed after a car accident, he was still achieving this. And it’s something he kept up for at least two years. It became a habit and a love. However, Jon does appreciate that for the average business owner who wants a blog, this level of training isn’t strictly necessary. What you blog, and how you blog, depends on the overall goal you’re hoping to achieve. It has been statistically proven that longer posts rank better on Google, with one’s over 2,000 words getting a nice little bump up. And BuzzSumo says that long posts receive more shares. At Copyblogger, Jon says that they noted that their longer posts got more shares, even though people were less likely to finish reading it. This perhaps is because of an assumption that longer posts add value, and are of a higher quality. On the other hand, that doesn’t mean you should fill your posts with fluff to make the posts longer. Everything still needs to be tight and valuable. Most of the posts which Jon writes are over 3,000 words in length. And they’re brilliant because he thinks of them as 5,000-word posts condensed down. However, Jon has also noted a trend with his own blogs which have caused him to experiment with much shorter posts too. He’s found that the longer someone is subscribed to his emails, the less likely they become to actually click the links. And he suspects that’s because he has trained them to expect a long post, which causes them to hesitate it reading it. As you will have noticed, Jon knows all his facts and figures. He knows his results, tracks whether he achieves his goals, and makes effective strategies out of his findings. He completely knows his blog, and business, inside out. And it is that level of comprehension and dedication which has earned him his reputation and success. 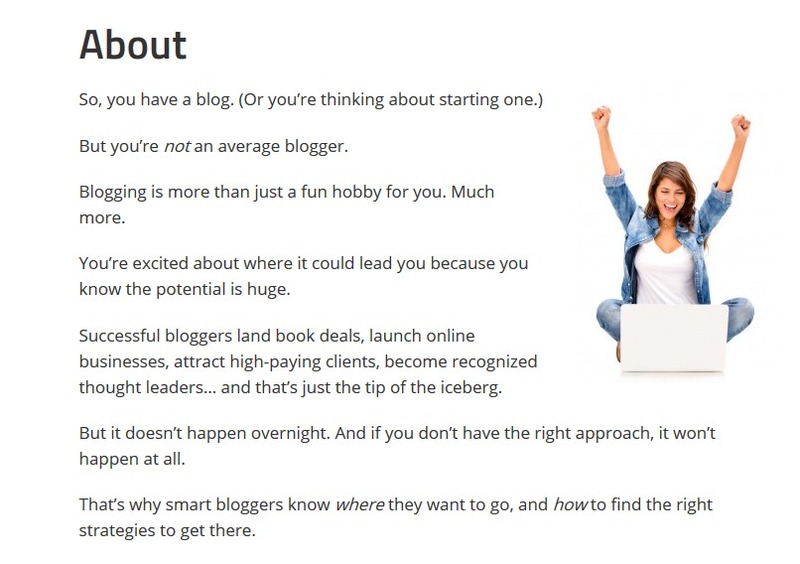 These are all things a blogger should know about their efforts. And with Smart Blogger, Jon Morrow helps his readers really get to grips with their own blogs so they literally have nothing holding them back. So make some time to read over his blog posts. They may be long, but you know every word really is worth reading. You’ll also discover how good his headlines are. So make sure you download his Headline Hacks so you can write some awesome blog titles which will make people want to read them straight away.